I started learning my first computer programming language over a year ago and currently learning my second alongside my uni work so whether you’re completely new to programming or you just want to improve your skills I’m here to help! From my experience, this is what I think every programmer needs to know. You’re the only one that knows this so it’s worth figuring out when you’re most productive and how! If you’re struggling try different scenarios and see what you prefer? After ages of looking at a computer screen or trying to fix an error you’re going to need a break at some point. Go make food and drink or just simply take a step back for a couple of minutes, sometimes that’s all you need to get back into the swing of it! Turn your phone off or on silent, switch off any social media notifications and turn on your ‘Do Not Disturb’ mode to people around you. I know this is going to hard for the majority of you (even I can’t always do it) but try your hardest and you’ll see the improvement! The worst thing you can do is learn something new and when you look back at it you think “Oh what’s this again?” so above anything you feel useful add a line stating its purpose; this means when you go onto it at a later date you’ll be able to have a better understanding of your work! 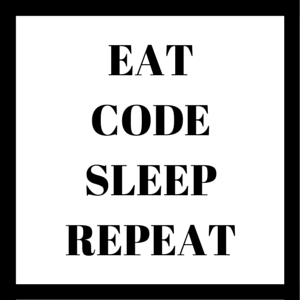 Programming can become stressful and there are going to be times when you want to give up but don’t! Just take a breather or a day off so your brain to recharge and keep trying because you’ll feel x10 better when you see the progress you’ve made! One of the best ways to learn something new is from others. Talk to any friends or family that know the programming language or alternatively look online for tutorials, forums etc. A website that I started using is Topcoder – you can do challenges to help improve skills and see what level you’re at, there are forums too so you can ask others questions that you may have! It might be difficult at times but you’ll prefer it more if you enjoy it! Do you own little side projects like designing your own app or website? You never know you might find a new hobby! Do you have any advice to give or do you have a question of your own? Either way feel free to comment or ask me a question! I hope this helps anyone out there needing some advice on coding!